Where did that week go?! Since I posted about LTEV, so much has happened!! Things are fine and good, but ridiculously busy. I've been working through more ms edits (I love my editor, she has clever ideas and has helped shaped themes in the book), and also have some changes going on in our household that have been exciting, overwhelming, and exhausting all at once! All this left my wee blog on the back burner. And, since I've been relying on freezer stock of soups and mealtime quick-fixes, I don't have any food photos from this week. But, I do have a teaser. Well, I couldn't sit tight. I didn't know the ingredients, and obviously hadn't tasted it, but knew I could make my own hummus salad dressing. And make it better! I got to testing, and here you have it: Dreena's Hummus Salad Dressing. It is thick, tangy, rich, and low in fat. Back to the story. (The dressing, that is, not Hop on Pop.) So, I make this dressing and now LOVE it. I want to get it in the new book, but my manuscript is signed, sealed and delivered. Luckily, my editor is understanding of my recipe neurosis. When my ms came back for edits, I was able to squeeze it in (along with one other recipe, hee). So, now you too will be able to 'Snack, Snack, eat a Snack. Eat a snack with Brown and Black'... drizzled with Dreena's Hummus Salad Dressing. And, I still haven't tried Trader Joe's version (have you?). No hard feelings, Trader Joe's, because I think you're pretty awesome. And, you did inspire my creative process on this one. But, I think my dressing will be better than yours, and healthier. Let the taste testing begin. Yummy! I can't wait to try it. Are you still in Canada, Dreena? President's Choice came out with a hummus salad dressing this summer, too (bet it's the same at TJ's) and I've been addicted to it since first bite. I bet yours will be better that it, too! I saw that at TJ's the other day and tried making my own, too. But I am definitely no chef and didn't like mine much. Spring 2012 is too long to wait!! Why can't I link to the recipe?! I want to link! I WANT TO LINK!!! WAH!!! good for you! I inadvertently made my own hummus salad dressing when I realized that the lemon juice, braggs and ACV I was putting on top of my huge dollop of hummus on top of my salad made for a DELISH thinned out hummus dressing. Hoping you post yours on your blog! Can't wait to try it! Congrats on submitting the manuscript! Hummus and avocado are two of my favourite things. 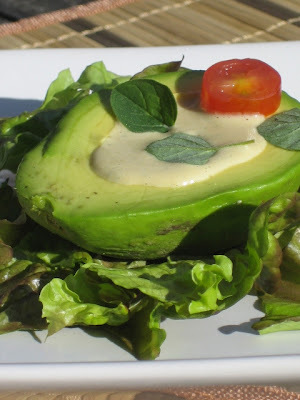 Hummus dressing on avocado sounds totally fantastic! This looks very lovely. Avocado and hummus are two very healthy food that are joint together. Thank you for sharing this. Yummy, Dreena. Looking forward to your new cookbook next spring. I'm going to make your lentil and sunflower seed pie for my son now that he's eating sunflower seeds. I think I'm really going to make it because you mentioned in the cookbook that it makes for a yummy sandwich filling with vegan mayo. That is a great idea, Dreena. I love your hummus, so how could I not love your hummus dressing? Your Hummus Salad Dressing looks great. Would it be possible to get the recipe? I wasn't able to open the link highlighted in red. This is a lovely recipe! avocado chick peas are really healthy. I want to try this. THank you for sharing.